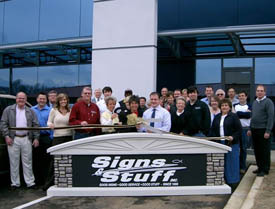 About Signs and Stuff, Inc. 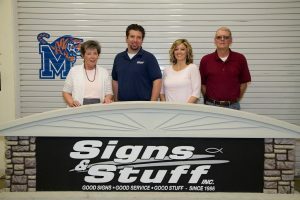 Founded in 1986 by sisters, Susie Nunnally and Cherie Jones, Signs and Stuff is a family sign business that offers a diverse line of high-quality sign products. Signs and Stuff started out as a home based business, and both owners were self-taught in making signs. 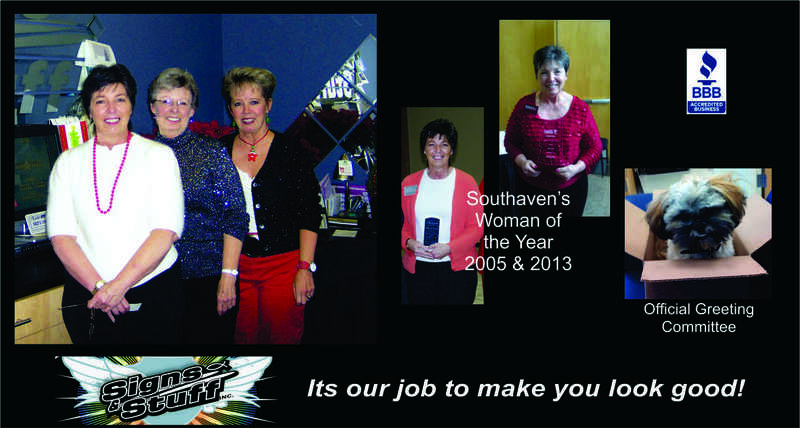 Although Susie Nunnally left the company in 1997, Signs and Stuff’s clientele and staff kept expanding. 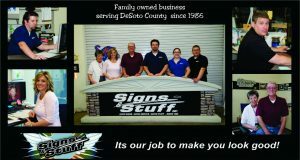 Signs and Stuff currently has 6 full-time employees, as well as several part-time helpers – all of which are highly trained to give our customers the best service possible. 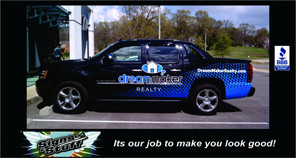 Our graphic designs are eye-catching, and our signs are made from the best materials. With an A+ rating from the Better Business Bureau, customer satisfaction is always priority! In the attempt to keep pace with technology in our ever-changing industry, Signs and Stuff moved to our first storefront location in 2001. We quickly outgrew that small retail space and moved to a more modern location on Goodman Road. This storefront was a new complex that had better facilities, including ample indoor space for vehicle wrapping and a “clean” environment for digital printing. After serving the community from this location for 12 years, Signs and Stuff built a bigger sign shop in Nesbit, Mississippi. 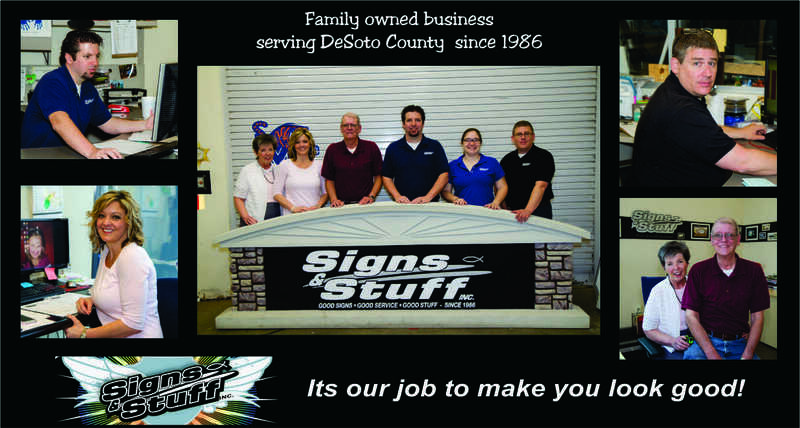 The mission of Signs and Stuff, Inc. is to meet the graphic and advertising needs of the DeSoto County and the north Mississippi area with excellence. We aim to provide these services with integrity and superior workmanship in a timely manner that pleases our customers. Our prices are very reasonable, allowing small businesses in our community to have a competitive marketing edge. It’s our job to make our customers look good! Signs and Stuff, Inc. is now run by the next generation! After graduating from Mississippi State University with a degree in Business/Finance, Rodney Jones joined the family business in 2003. 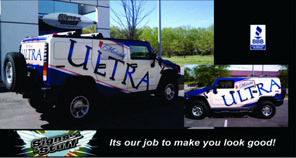 He runs the shop and organizes the production of all signs, posters, vehicle wraps, etc. His sister, Melissa Jones came on board in 2008 as we started to expand farther into North Mississippi. 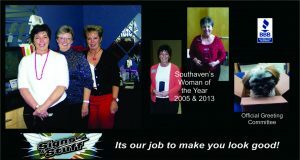 Melissa focuses on sales in the Lafayette County/Oxford/Ole Miss area as well as trade displays and promotional items.